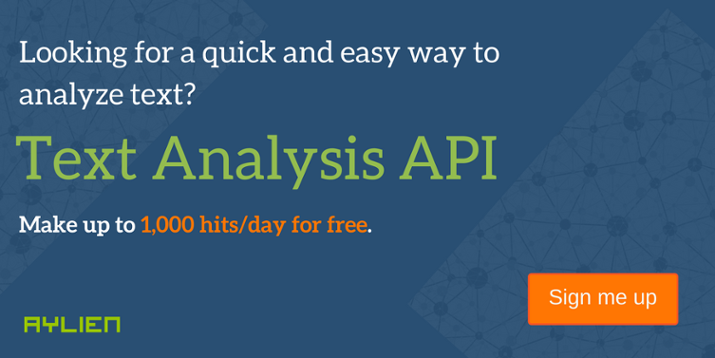 Getting up and running with AYLIEN’s Text Analysis APIs couldn’t be easier. It’s a simple 3 part process from signing up to calling the API. This blog will take you through the complete process of creating an account, retrieving your API Key and Application ID, and making your first call to the API. Navigate to http://aylien.com/getting-started/ and click on the “Subscribe” button. This will bring you to a sign up form which will ask for your details in order to setup your account and generate your credentials. Upon signing up you will receive an email with an activation link. Clicking on the link will activate your account and direct you to a sign in page (developer.aylien.com). Use the credentials you set in the sign up process to login. Next make your way to our getting started guide by clicking on the getting started button. Our getting started guide is designed to get you up and running with the API and making calls as quickly and as easily as possible. Here you will find information on the API Documentation, Features, Links to a demo and some code snippets. We have included sample code snippets for you to use in the following languages. To start making calls, while you’re on the getting started page, scroll down to the “Calling the API” section. Choose which language you wish to use and take a copy of the code snippet. In this example, we are going to use Node.js. We are going to walk through two very simple examples of how to call the API. The first analyzing a simple piece of text for sentiment and language detection and the second, analyzing a URL. First things first, copy your code snippet and paste into a text editor. Replace the YOUR_APP_KEY and YOUR_APP_ID constant placeholders in the code with the “Key” and “App ID” from your credentials and save the file. In this case I have called it codesnippet.js. The code snippet is very simple; it sets up the parameters to use with the endpoints as ‘text’ with just one sentence to analyze i.e. ‘John is a very good football player!’. We are going to make two calls to the API to analyze the sentiment (whether it’s positive, negative or neutral) and to detect what language it is written in. To run the application on Windows open a command prompt and run the snippet by typing “node” followed by the path to your text file (assuming you have Node.js installed on your computer, if not you can get it from http://nodejs.org/download/). So that’s a pretty simple example, but what if we want to do something a little more advanced like analyzing a URL. Let’s say we have an article online that we want to analyze. We want to summarize it, extract any entities mentioned and generate optimal hashtags for that article so we can be sure we maximize its exposure. In this case we are going to analyze an article about the iPhone 6. There is just a couple of changes we will need to make from the last example in order to summarize the article, extract the entities mentioned and generate some hashtags. And use alternative API calls. You can find a full list of features and end-points in our documentation. Why the entry-level iPhone 6 has just 16GB of storage +nnThe lack of a strong reaction, either positive or negative, to the iPhone 6 series is largely due to the fact that the iPhone 6 and iPhone 6 Plus don’t introduce a lot of revolutionary new features – there are hardware updates aplenty, of course, but they’re generally incremental upgrades, bringing Apple’s top-end devices into relative parity with the latest from Samsung, et al. These are the phones Apple devotees have been waiting for: iPhones that measure up to what’s fast becoming the new normal – the large, modern smartphone display. Make no mistake: The most important new thing about the iPhone 6 and iPhone 6 Plus is their size. There you have it, that’s how easy it is to get up and running with AYLIEN Text Analysis API.